Can someone get Quentin Tarantino on the line? 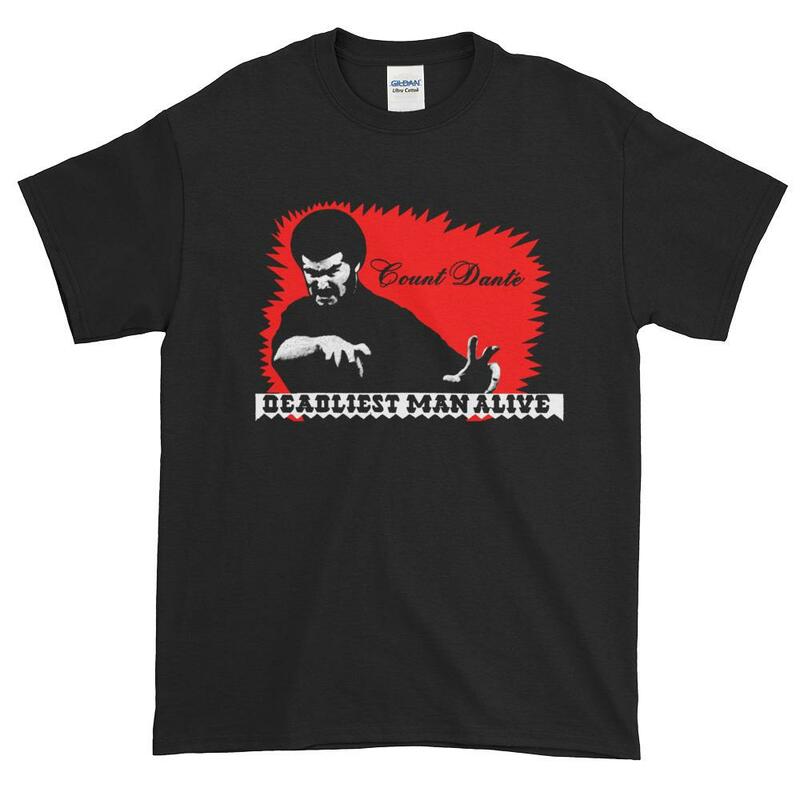 The other day, I went on Anthony Durso’s awesome Retropolis Tees site to do some shopping (more on that soon) and came upon one of his most popular items — a shirt featuring the classic Bronze Age image of Count Dante: Deadliest Man Alive. Count Dante ads were a mainstay of early ’70s comics and this particular one was the kind of thing that burned into your brain with a hot-pink intensity. 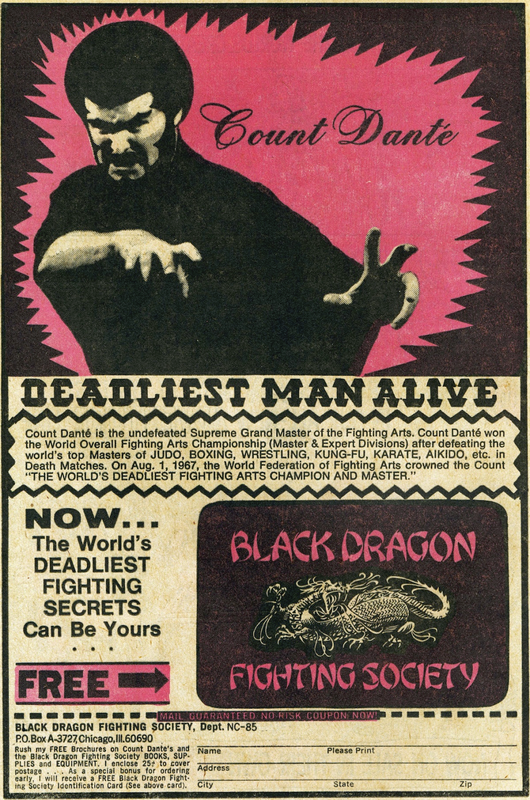 The whole idea of a Count Dante who heads something as chop-socky as the Black Dragon Fighting Society and can teach you the World’s Deadliest Fighting Secrets from a pamphlet purchased through an ad in Amazing Spider-Man is wonderfully far out, like an Irving Mainway fever dream. But Count Dante — born John Timothy Keehan — was a living, breathing martial-arts master based in Chicago in the ’60s and ’70s — and I gotta tell you, I can’t believe it’s taken this long for anyone in Hollywood to figure out that his life story demands an off-kilter biopic. A deeper dig shows that some of the profile was lifted directly (unsurprisingly) from an excellent profile in the Chicago Reader from 12 years ago that lays out Dante’s bizarrely entertaining life, including his role in provoking a fatal dojo war; his pet lion cub; his run-ins with the mob; his possible participation in a multimillion-dollar heist; and, perhaps most improbably of all, his stint as a hairdresser. He died in 1975 at only 36 years old. Click here to read the whole thing. You’ll be absolutely thrilled you did because it reads like an obscure treatment for a film just dying to be made by a grindhouse evangelist like Quentin Tarantino or, if he’s busy, someone like Paul Thomas Anderson. Unfortunately, Big Time Hollywood appears to be asleep to the notion. But hey, who knows: An Illinois filmmaker named Floyd Webb, who was quoted in the Reader piece, had a passing encounter with Dante back when he was a kid and has been keeping the flame alive. He’s been trying to pull together financing for a Count Dante documentary for more than a decade and he’s still at it. If you’re interested in finding out more about the project, check it out here. In any event, I’m hoping that some deep-pocketed producer comes along and finances the flick we’re all dying to see. Until then, I await my Count Dante T-shirt’s arrival in the mail. But I’ll pass on learning the Death Touch.